★The Zento Deals 3-in-1 Hand Siphon Pump is a most important and practical accessory to always have in your car. It pumps Gas Oil or any Liquid into your car as well as Air into inflatable objects such as rafts, tires, swimming pools etc. When you're stuck with an empty tank the Zento Deals Siphon Pump enables you to quickly and Easily Pump the gas from the carry on container to the gas tank. That will comfortably take you to the nearest gas station where you can refuel once again. ★Instead of having to blow by mouth into your air mattress, kid's swimming pool, tube, rafts or even tires the Zento Deals Pump will do the job instead of you. Not only will it do your job but it will do it much Faster. ★The Zento Deals Super Handy Pump Functions Three Ways: The Liquid pump moves large volumes of gas water or any other liquid; The Siphon function can draw fuel from tank or oil from crankcase; The Air pump can be used to inflate water toys, pool accessories air mattresses and more. To stop the flow at any time, simply Depress the handle. ★The Zento Deals Siphon Pumps includes all needed Hoses, Tubes and Connectors as well as Inflation Adapters. 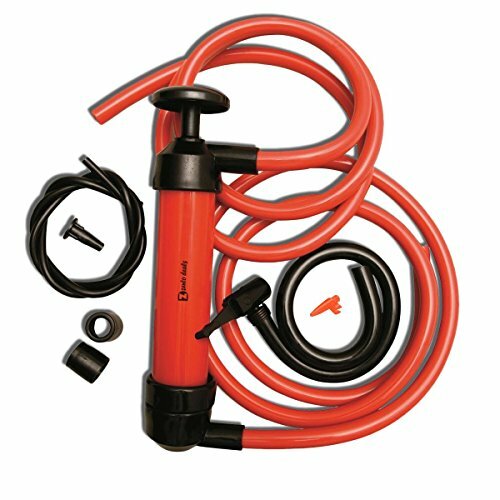 The easy to use pump is extremely handy for any car owner. ★The pump is constructed out of Premium Quality material to provide you with the strongest most Durable pump available. It will last superbly year after year. Zento Deals is known for its superior products, quality, and service. ★ THREE FUNCTION 3in1 - The Liquid pump moves large volumes of gas water or any other liquid. The Siphon function can draw fuel from tank or oil from crankcase. The Air pump can be used to inflate pool accessories air mattresses and more. When you're stuck with an empty tank the Zento Deals Siphon Pump enables you to quickly and easily pump the gas from the carry on container to the gas tank. That will comfortably take you to the nearest gas station where you can refuel once again. ★ PUMPING - The intake tube is placed at the bottom of the liquid to be moved and the outgoing tube is fed into the receptacle receiving the liquid. Pump the handle a couple of times to prime the pump and then pull the handle fully out. To stop the flow at any time, simply depress the handle. ★ FAST - Instead of having to blow by mouth into your air mattress, kid's swimming pool, tube, rafts or even tires the Zento Deals Pump will do the job instead of you. Not only will it do your job but it will do it much faster. ★ COMPLETE - The Zento Deals Siphon Pumps includes all needed hoses, tubes and connectors as well as inflation adapters. The easy to use pump is extremely handy for any car owner. ★ PREMIUM QUALITY - The pump is constructed out of a premium quality material to provide you with the strongest most durable pump available. It will last superbly year after year. If you have any questions about this product by Zento Deals, contact us by completing and submitting the form below. If you are looking for a specif part number, please include it with your message.